Though there was a respite in rainfall on Saturday, the water level in major dams continued at the full capacity level. 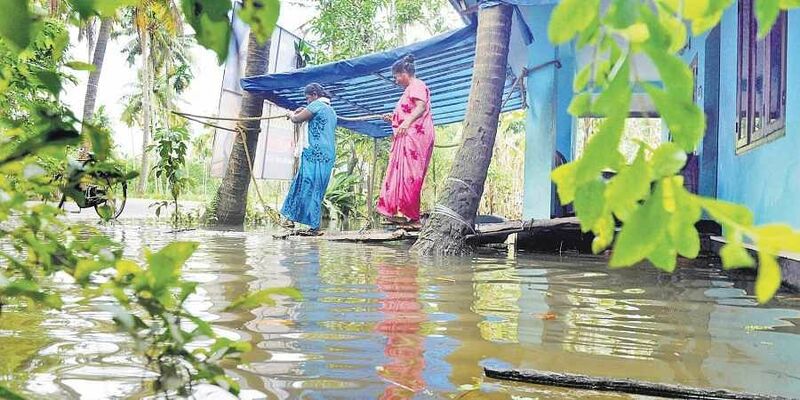 KOCHI: The residents of Cheruthoni and downstream areas heaved a sigh of relief as the water level in Idukki dam started receding on Saturday morning. However, the threat of another bout of heavy rain loomed large over Idukki as inclement weather continued in the district. Meanwhile, the Met Department has predicted heavy rains over the next couple of days in the state causing concern among the people living on the banks of the river. At 7 pm on Saturday, the water level in the Idukki reservoir stood at 2400.32 feet despite the KSEB releasing water at the rate of 7.5 lakh litres per second (or 750 cumecs). The hourly inflow decreased to 477 cumecs as there was a let-up in rainfall. However at 9 pm, water level came down to 2400.18 ft, the inflow increased to 479 cumecs. According to KSEB chairman N S Pillai, the water release will continue for two more days till stability is achieved. “We are discharging more water than what we receive in the reservoir. Still the water level continues to be above 2400 ft.
Once the water level reaches 2399 ft, we will review the situation. If the rains subside and inflow decreases considerably we will stop discharge of water at 2399 feet. We have to maintain a balance between the inflow and outflow. We need 125 cumecs of water per day for power generation. We will take a call after waiting for the next two days as the Met Department has predicted heavy rains,” he said. Power Minister M M Mani and Forest Minister K Raju conducted a review meeting at Kattappana government college on Saturday. KSEB authorities have assured power distribution in the flood-affected areas would be restored within two days. Though there was a respite in rainfall on Saturday, the water level in major dams continued at the full capacity level. The KSEB continued releasing water from Pampa, Kakki, Sholayar, Idamalayar, Kuttiyadi and Thariyode dams.